Datenbank- und Informationssysteme - News Single - Prof. Dr. Gregor Engels hat am 18. Juni 2015 einen Vortrag zum Thema "Domain-specific Languages for On-the-Fly Computing Markets" im Rahmen des 10th Symposiums on Future Trends in Service-Oriented Computing in Potsdam gehalten. Prof. Dr. Gregor Engels hat am 18. 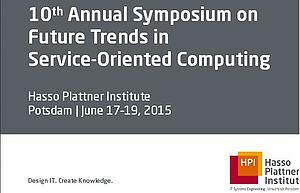 Juni 2015 einen Vortrag zum Thema "Domain-specific Languages for On-the-Fly Computing Markets" im Rahmen des 10th Symposiums on Future Trends in Service-Oriented Computing in Potsdam gehalten.